You can coordinate a night light to go with a guest bedroom decor with this simple recycling project. Cut your plastic glass cup in half, using a craft knife. The easiest way is to scratch the surface with your craft knife and then gently push the knife through. Don’t immediately push the craft knife through the plastic or your glass may crack. If the edges of your container are very sharp, sand the edges a bit with sandpaper. This will help to prevent cutting yourself on the edges, while you work with it. Cut a scrap of fabric to fit the outside of the shade by placing your container on the wrong side of your fabric and drawing around the edges. Cut your fabric about ½ inch larger all the way around to allow for the overlap inside. Place your glass half bottom on top of a fabric scrap and draw around the shape of the bottom half of the container (this will cover the top section of your shade). Do not allow any extra fabric, as you want this piece to fit perfectly. Hot glue your small piece of fabric to the bottom of the container, applying the glue along the edge. If you have any slight overhang, trim it away with scissors. The hot glue will keep your fabric from fraying away. Hot glue your side fabric scrap around the sides of the container, lining up the two pieces of fabric, where they meet at the top of the shade (you’ll cover this seam with a little trim later). Turn and hot glue the overhang inside the container. Be sure to apply hot glue along the edges to keep your fabric from unraveling. 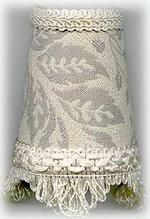 Add a piece of decorative trim to the top seam (see photo) and along the bottom. To attach your shade to your night light, plug your light into a wall socket, apply a drop of super glue or other heat resistant glue to the top of the purchased night light cover (not the bulb). Gently place your shade over the night light cover, allowing the shade to go as tight to the wall as possible and secure your shade to the nightlight cover. Don’t use hot glue to secure the shade to the nightlight. The heat from the light will soften the hot glue and if you touch your shade, it will come away from the light. Have fun with these, they really are quite pretty!